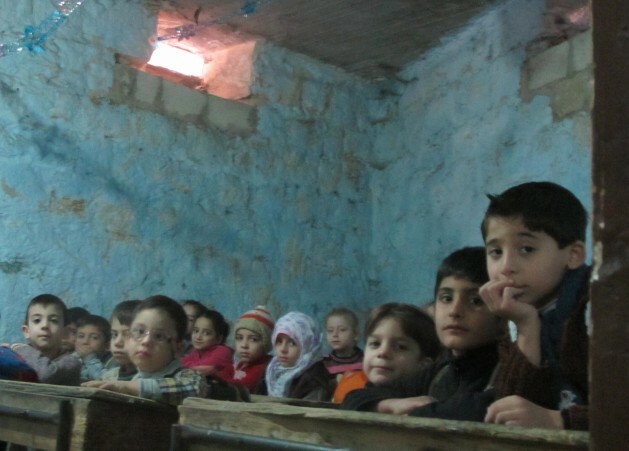 ALEPPO, Nov 6 2014 (IPS) - Winter has not yet hit this nearly besieged city, but children are already attending classes in winter coats and stocking hats. A few of the children in the co-ed primary school seem shell-shocked, but many smile and laugh readily on the crowded wooden benches stuffed into the cramped, cold spaces. The jihadist group is still battling to retake terrain in the area, with the closest frontline against them being in Marea, an estimated 30 kilometres away from opposition-held areas of eastern Aleppo. They must also witness the destruction wrought by the regime, which is trying to impose a total siege on opposition areas and which would need to take only a few kilometres more of terrain to do so. 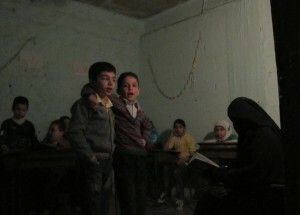 Those preparing for the baccalaureate – the Syrian secondary school diploma – study at home, he said. They then come to centres on established dates to actually take the exams in late June and early July. Word is spread of where they will be held via the Aleppo Today television channel, which broadcasts out of Gaziantep, and posters are put up around the city to announce the times and places. The barrel bombs stopped entirely for a number of days earlier this autumn after rebel forces closed in on the Aleppo air defence factories where the crude bombs made of scrap metal and explosives are assembled by regime forces. The bombing has since resumed following regime gains. On arriving at the scene of one such attack in late October, IPS saw a body pulled from the rubble by the civil defence forces before they rushed with flashlights around the block to get to the other side of the collapsed building, where three young children had been trapped underneath the rubble. All were later found dead.